18,783 • This is my winter project build from a State Black Label frame in Nightshade Purple. SRAM Courier, H+Son wheels with Origin8 hubs. 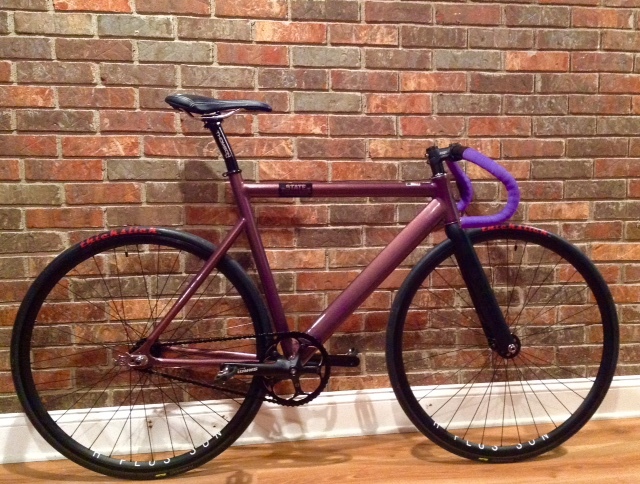 Thompson seat post, FSA Orbit headset, FSA stem, Origin8 Propulsion bar with State purple tape. Red letter Thickslicks, Candy S pedals and a Surly Tugnut tensioner. Cogs are Dura Ace 16/15. Hope y’all dig it. 46 and fixed in Johnson City, Tennessee.